There’s quite a bit of content on this page. It’s organized in the following order, so just scroll down to whatever you’re looking for. This page is constantly growing, so check back often for new content! The Ultimate Meal Planning Bundle is an amazing bundle of 30+ ready-to-use meal plans with shopping lists and prep notes, 5 ecourses, 5 ebooks, and 4 printable packs & workbooks, and- of course- tons of healthy recipes! I LOVE this and recommend it for anyone trying to get healthy. If you’re looking for colorful & cute, this is the one for you. 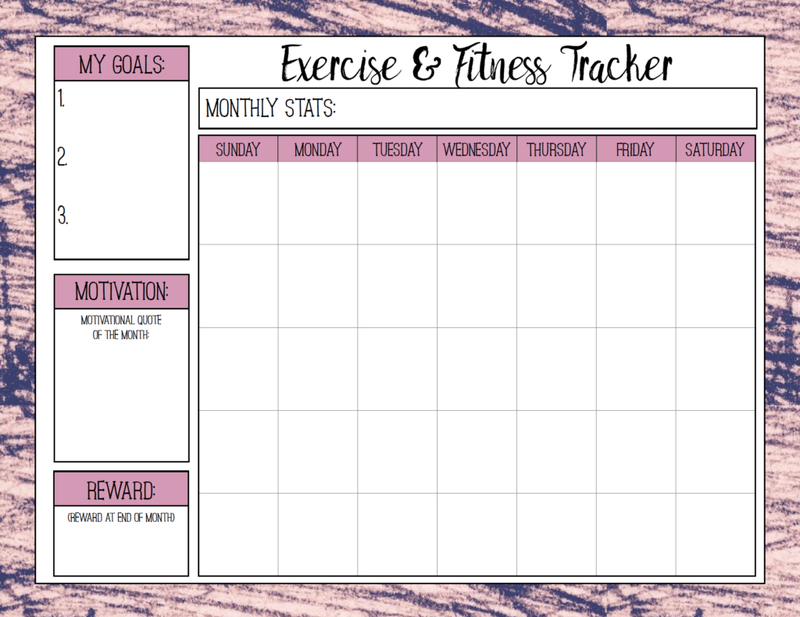 In addition to food tracking, there is water on each day, a spot of exercise, a place to write down weekly stats, and a spot for a motivational quote. This is a little more organized. There are spots for each meals plus snacks. 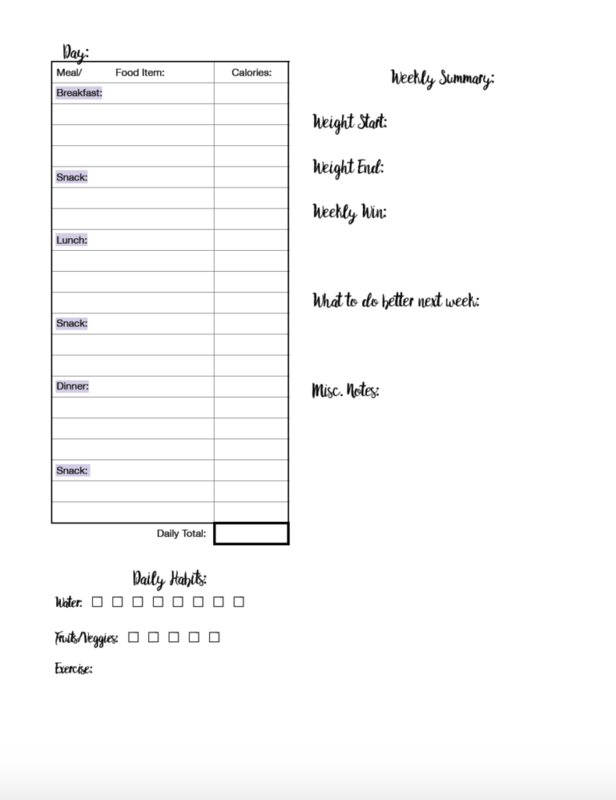 A small area to track exercise, and room for daily calorie total. 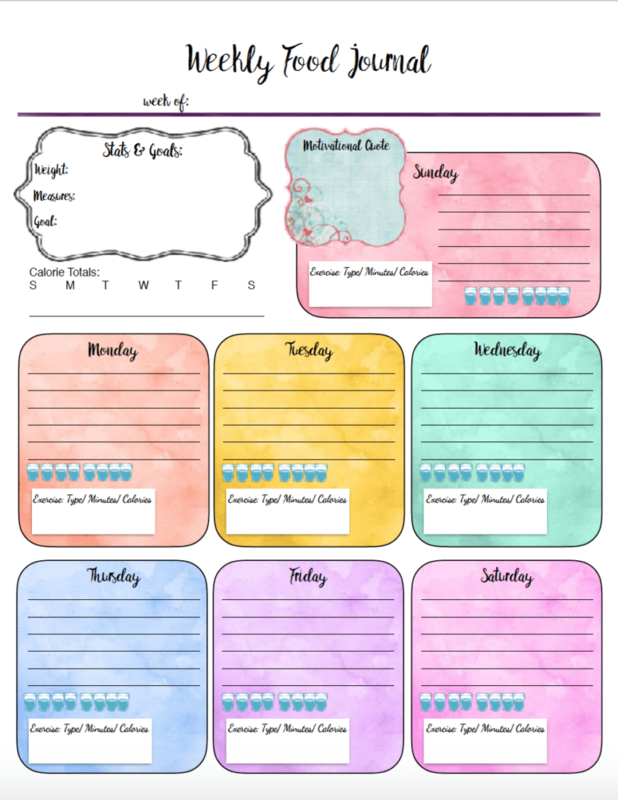 The side area includes a stats area and a spot to write your weekly goal. 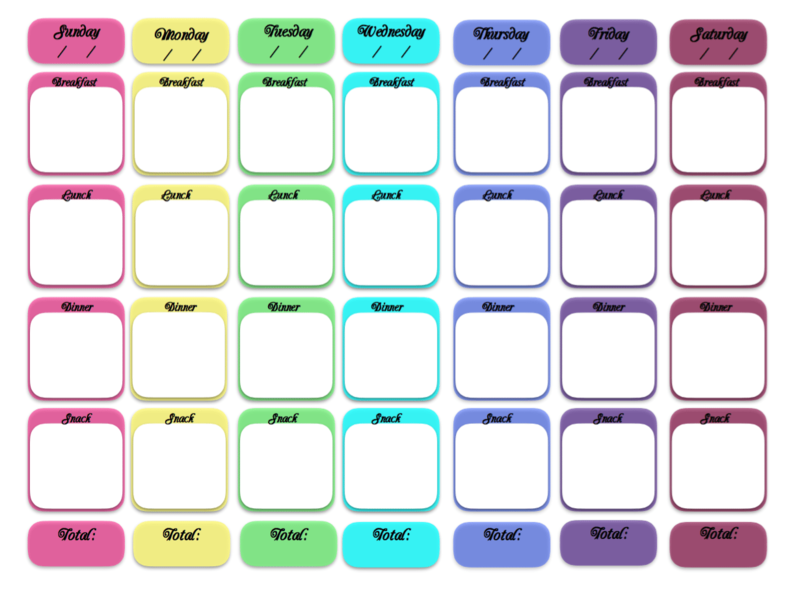 The area for tracking calories is a bit smaller, but there is extra room for tracking exercise. There is also a decent size stats/misc. area in case you’re making additional notes. I often note weight, measurements, or specific food goals (such as veggie servings or whole grains) in the last column. 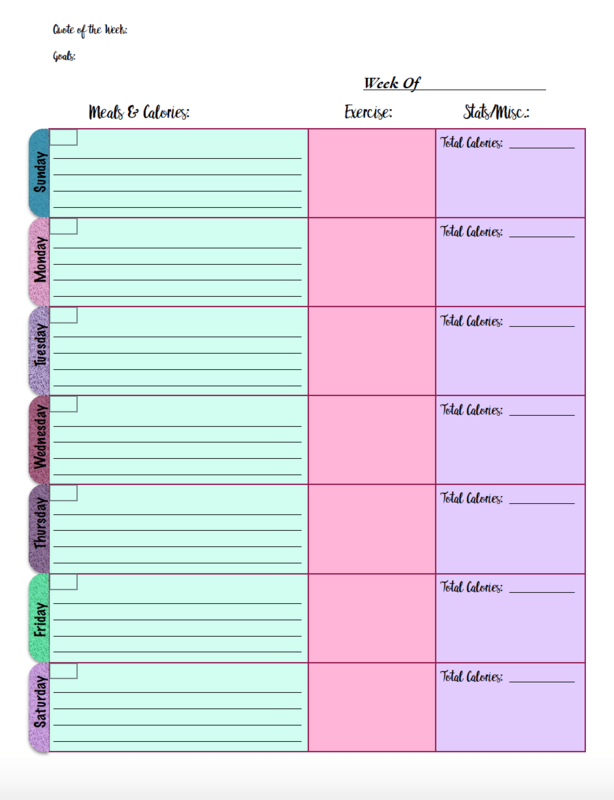 There is space at the top for making a weekly goal as well as writing a motivational quote. The same as the journal next to this, except in mostly black and white. If you only have a black/white printer, this journal will work. The pink heavy line will simply print as a heavier black. This journal is actually 4 pages long, don’t get confused by the two images above. The first image (it has two day’s worth of tracking) has extended room for tracking meals and snacks. If you’re being very specific, this is a good journal. It also has more room for writing. There is also room to track food, water, and exercise. The second image is the end of week. 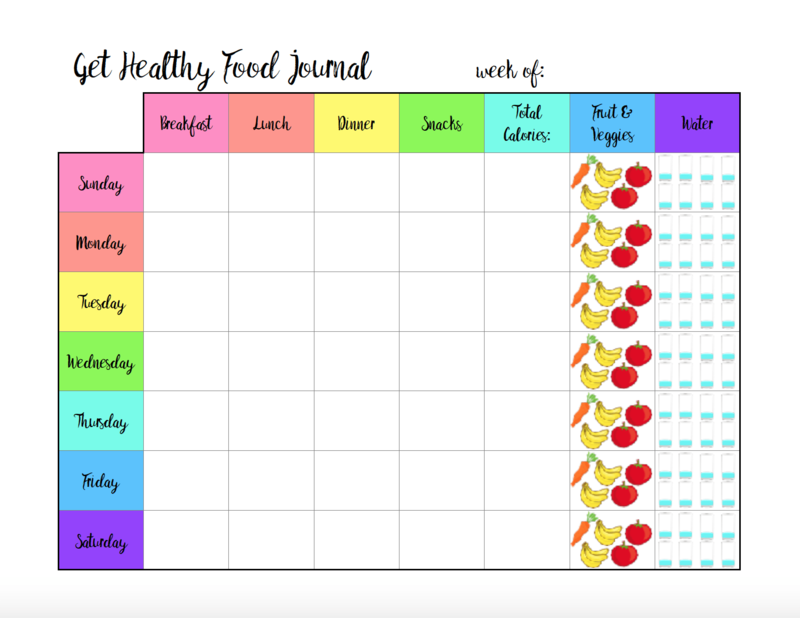 It includes the day 7 food journal as well as a summary section. I really, really like this aspect of the journal. 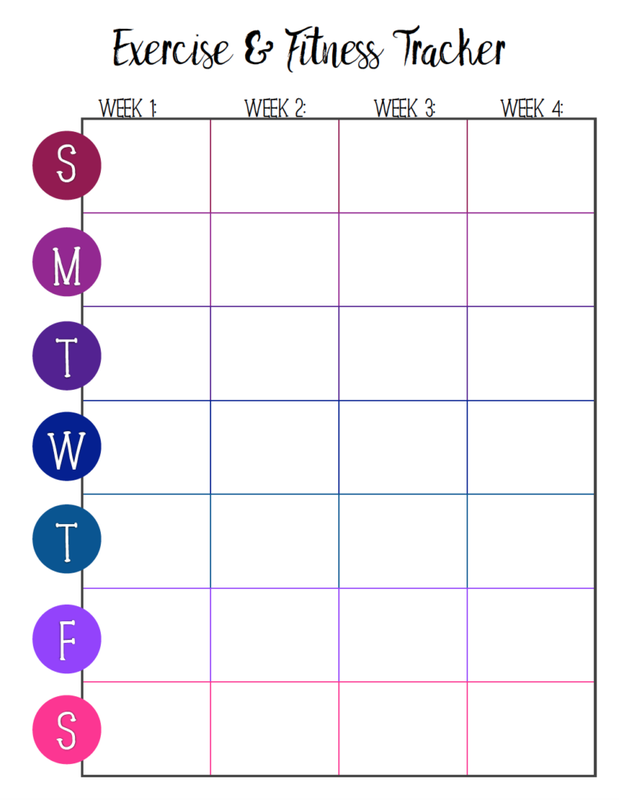 You can glance at week start and end, what you did well, and what you want to work on next week. This is an older design, but I still kind of like it. So I decided to keep it. This food journal is horizontal. Along with normal food tracking, there are 5 fruits/veggies to cross out each day along with 8 glasses of water! Very easy to keep track this way. This is probably my favorite of the batch as it allows for detailed tracking for both strength and cardio. 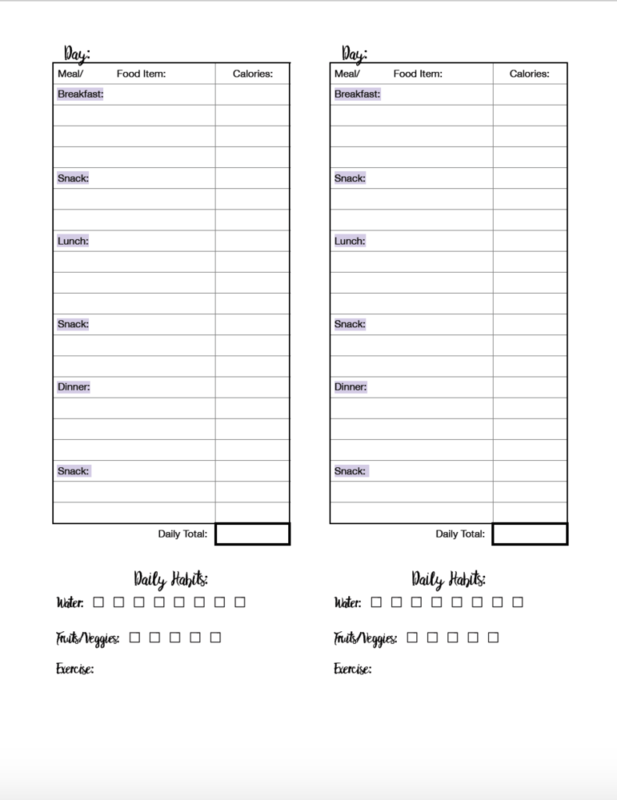 Very simple design, but big blocks for each day allow plenty of room to write. 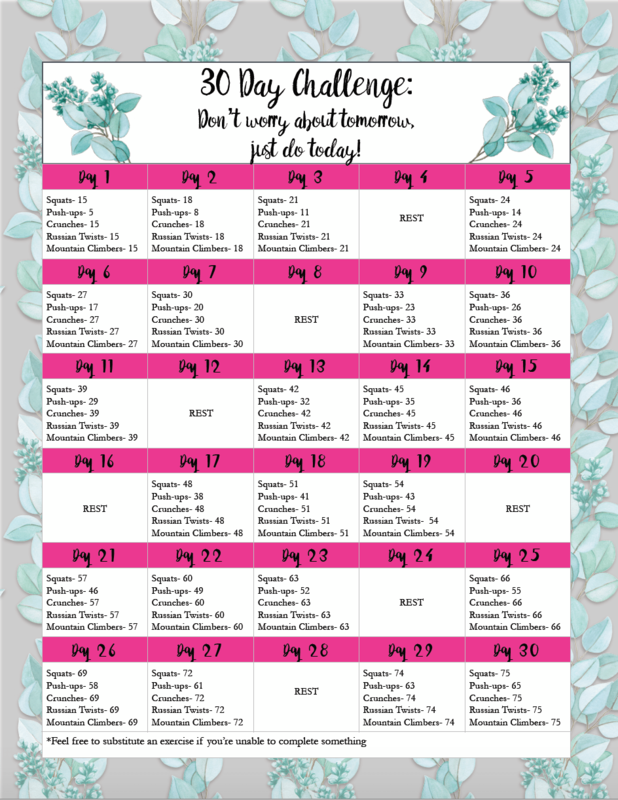 In addition, the week 1-4 format is easier than a regular calendar if you’re planning a regular schedule (such as monday-wednesday-friday) for certain exercises. Landscape design if that works better for you. 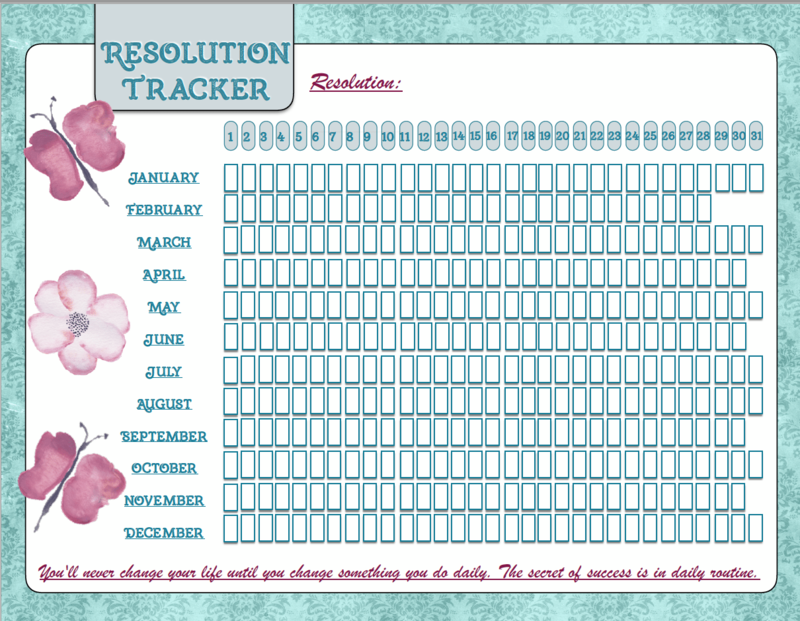 There is also space to set goals, track monthly stats, pick a motivational quote, and choose a reward for the month! There are two ways you can use this. 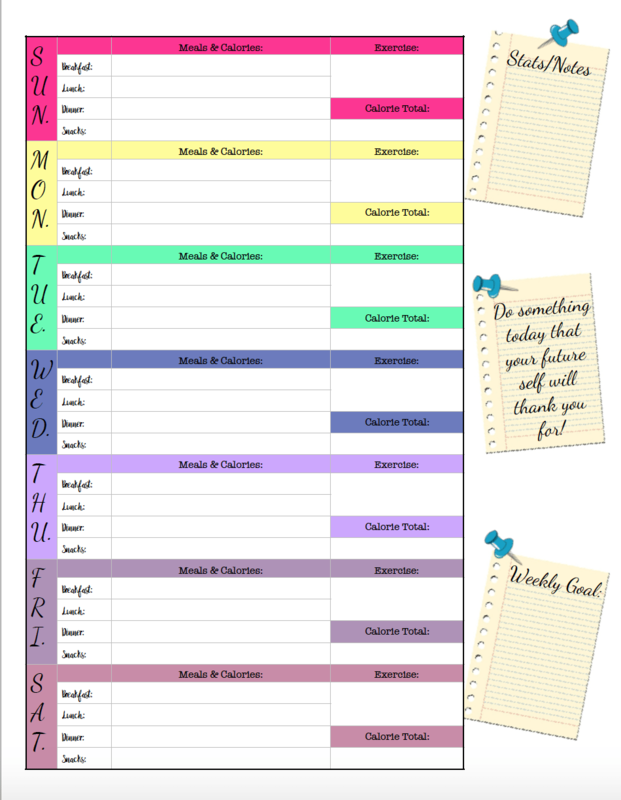 As a weekly printable workout journal or as a monthly workout journal. I prefer it as a monthly. • For weight, track on the days you desire. There are four spots. 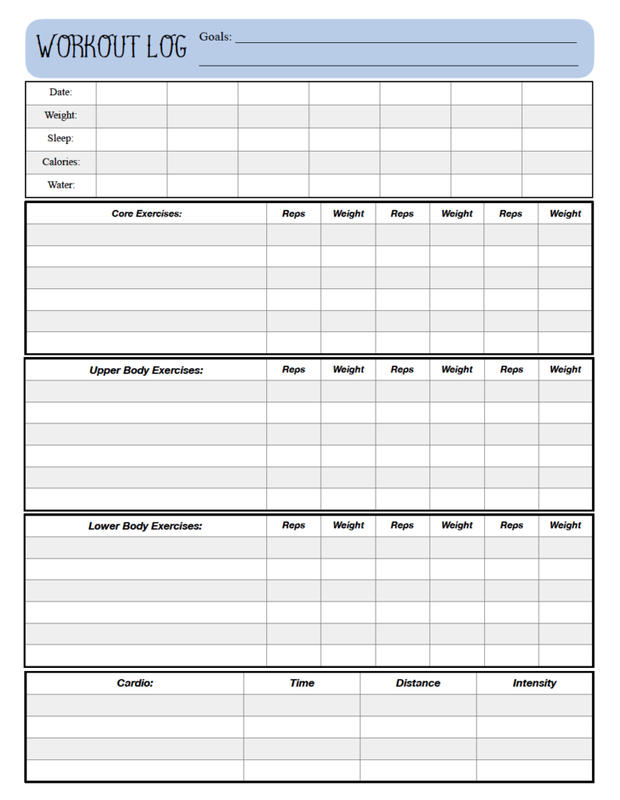 • For strength, simply assume each set is ‘1’ and track different reps and weights in each column. For example: Bicep curls- 1 set of 10 with 10 lbs. 1 set of 10 with 15 lbs. and 1 set of 10 with 10 lbs. This would all be during one workout. • For cardio, you can do intervals or simply just use a single column. • For weight, track at the beginning or the end of the week. • For strength, assume each column set (the set of sets/reps/weight) is a different workout. For example, for bicep curls: week one, in column one, I would do 3 sets of 10 with 10 lbs. During week two, in column two, I would do 3 sets of 10 with 15 lbs. There are enough lines that I can fit my three workout days (legs & abs, biceps & back, triceps & chest) all on the same log. 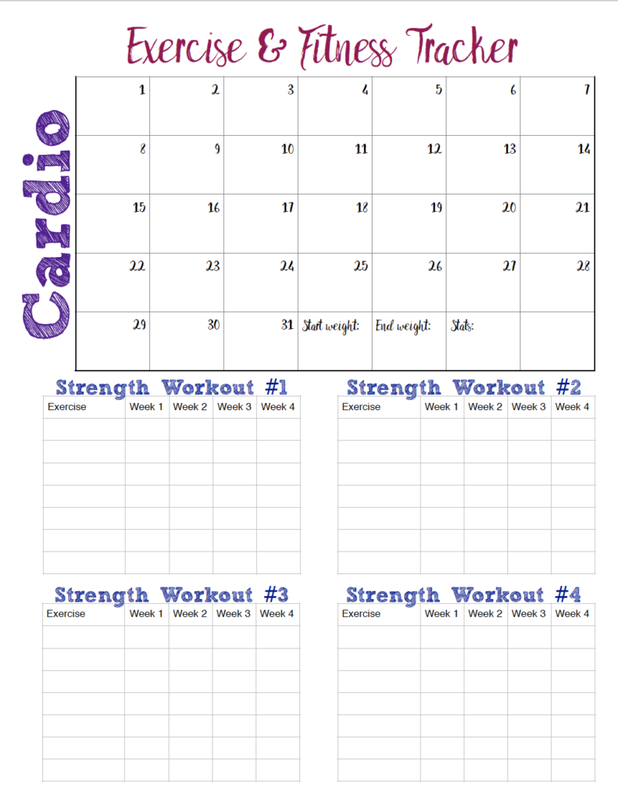 • For cardio, assume each set of column is a different workout week. 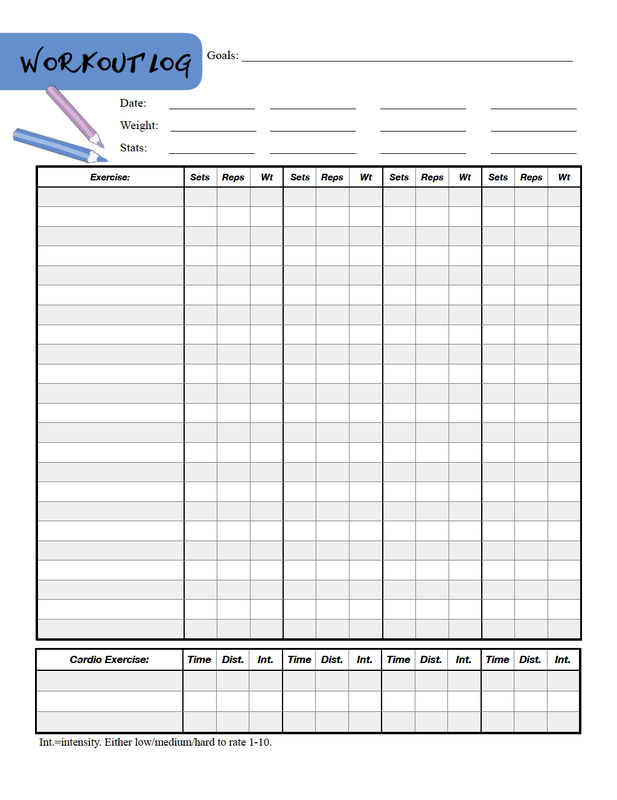 If you do multiple workouts in one week, use the rows to track. 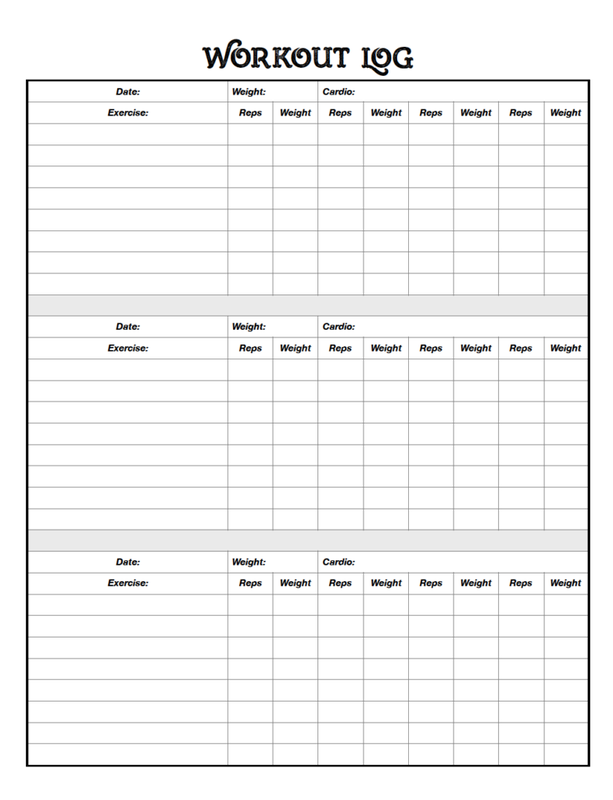 This weekly workout log is divided into three strength training sections: core, upper body, and lower body. There is a section for tracking three different sets for each exercise. There are also four rows for tracking cardio. In addition, you can track your weight, sleep, calories, and water intake. Tracks three different workout sessions. It has a spot for cardio if you’re someone who does cardio along with your strength workouts. (I’m looking at you, Jen, if you’re reading this!). There is room for 4 different sets on this one. This is a mood tracker for an entire year. Main moods are pre-numbered, but there are numbered spots for you to add some of your own. Pick the dominant mood of the day and enter into the appropriate box. 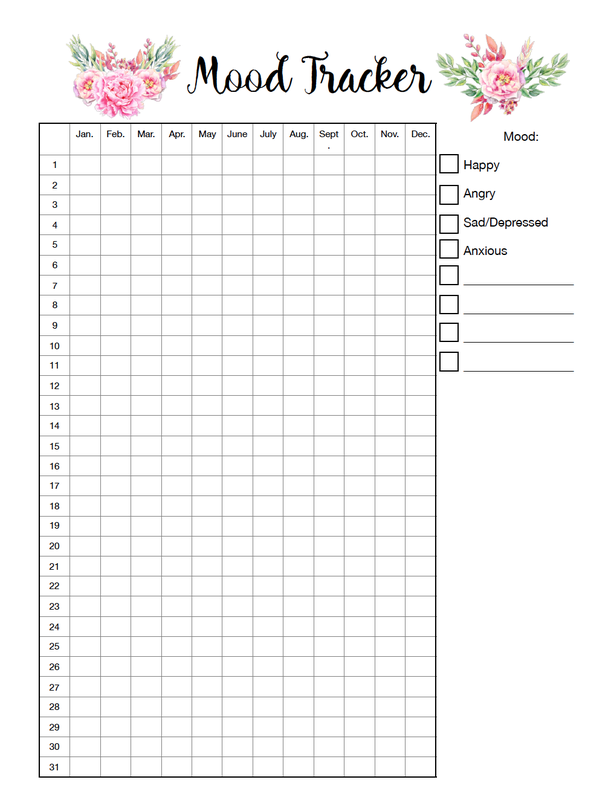 Mood Tracker1_pdf <<<Click on pdf to download the chart. This is a mood tracker for an entire year. In the little boxes before the mood, scribble in the color of your choice. Then color the dominant mood of the day into the appropriate day box. I made this one because sometimes it’s easier to see trends with colors instead of just a jumble of numbers. 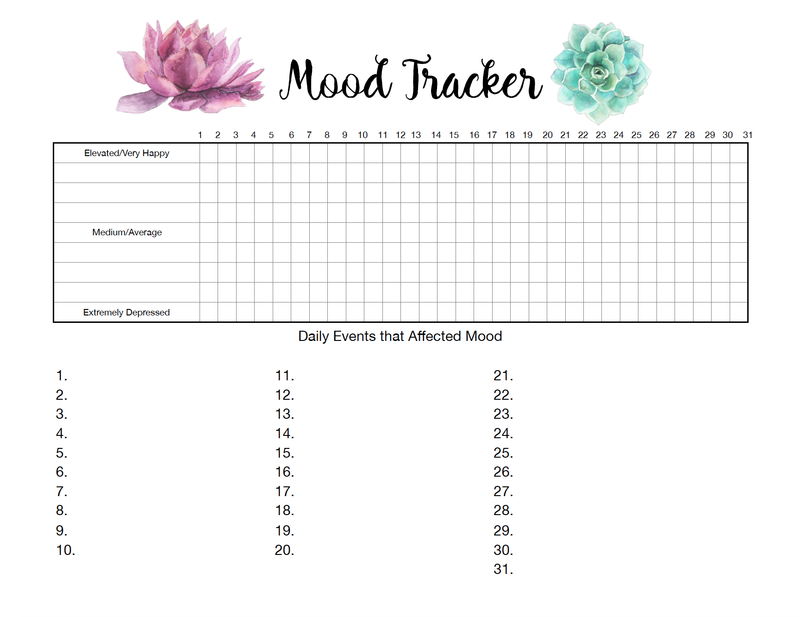 Mood Tracker2_pdf <<<Click on pdf to download the chart. This mood chart is for a single month. 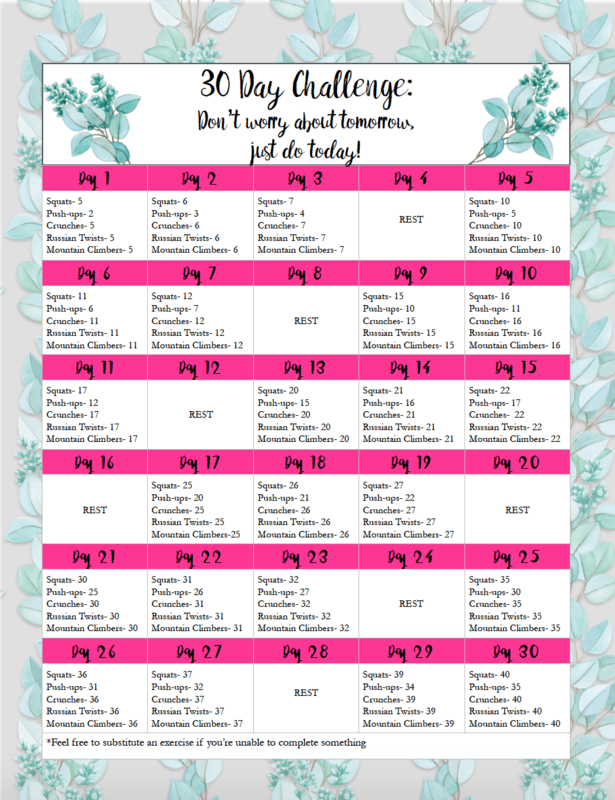 This is for those who are dealing with multiple emotions throughout the day and want to keep a more detailed log. 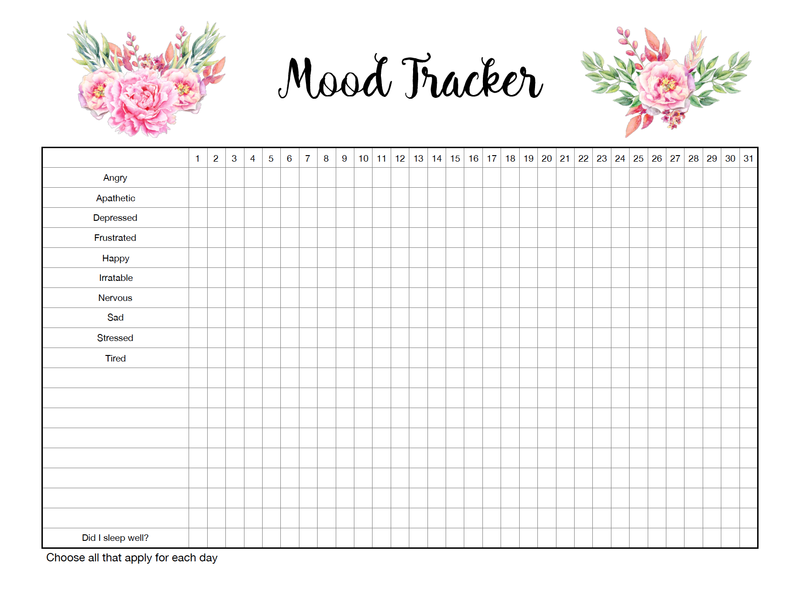 There are bunch of pre-filled out moods and plenty of spots to add other moods (or other items you want to track). 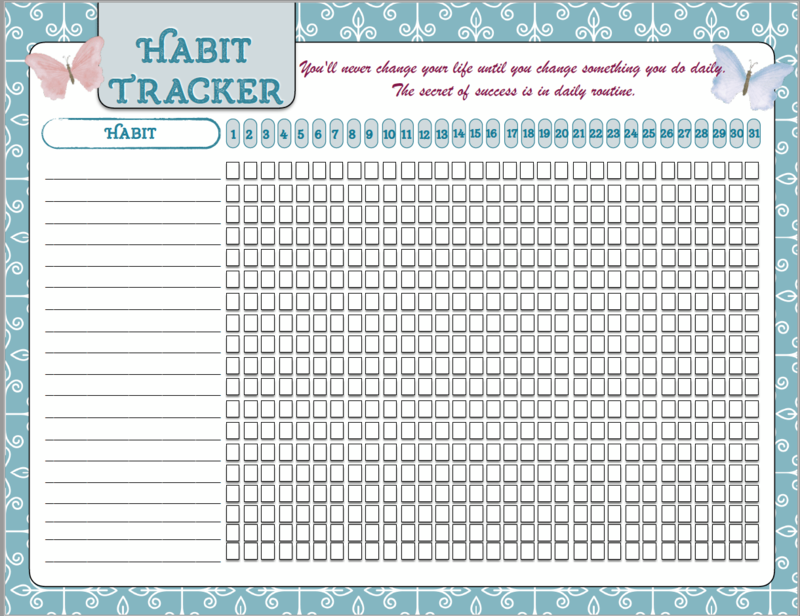 On this tracker, you’ll put a check mark for every mood you feel during the day. So you might have multiple checks for a single day. Mood Tracker3_pdf <<<Click on pdf to download the chart. This is another monthly mood tracker. 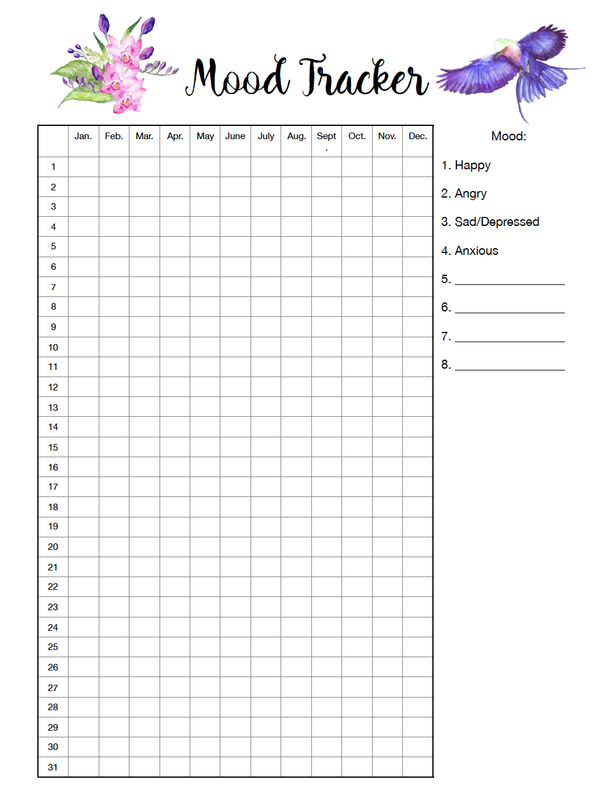 You rate your basic mood level and chart it throughout the month. In addition, there are spaces to write things that affect your mood during each particular day. Or activities/daily tasks so you can see if there is a pattern. 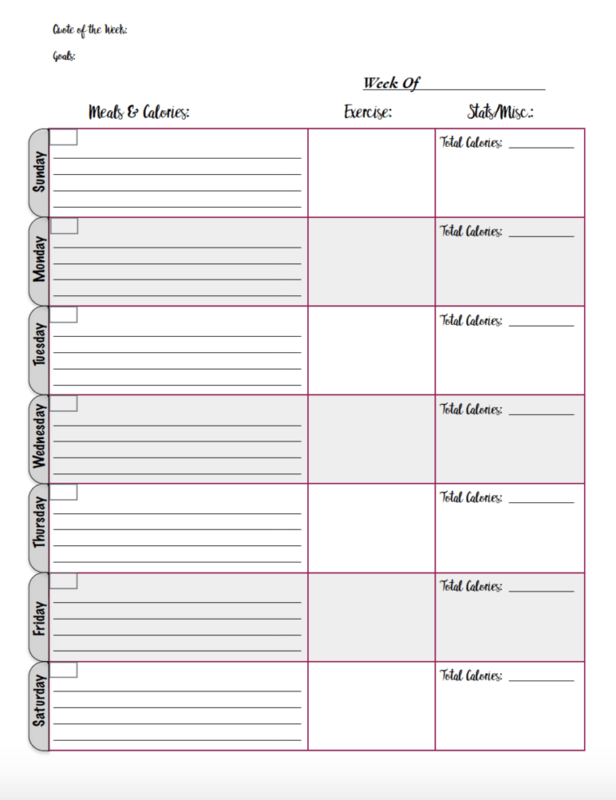 Mood Tracker4_pdf <<<Click on pdf to download the chart.